Kendama USA - Bigger is BETTER! The Kendama USA Tribute is made using only the best FSC-certified beech wood and unlike older traditional style kendama handles, this contemporary style does not separate, which simplifies the re-stringing process. The Tribute can be re-strung between right and left handed play simply and easily without taking the handle apart. The cup piece will never fall off like other kendama brands. The Tributes have GROWN!!! These monsters are a full 10 inches tall and built to the same proportions as the classic Tributes you love. Playing with a Tribute Jumbo Kendama this size brings on a whole new challenge; the weight is heavier, the size is bigger, and once you pick one up you'll just want to go bigger! 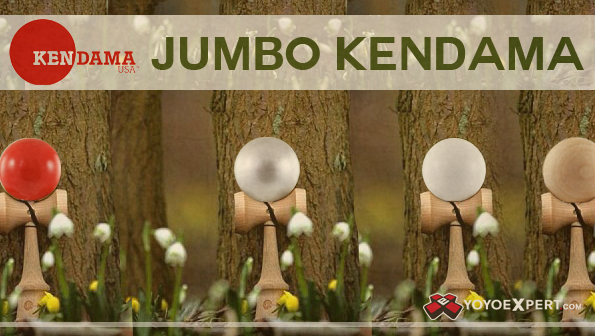 The Tribute Jumbo is the only jumbo kendama that uses an extra reinforcement in the handle to ensure the cups won't slide off during the play. It is perfect for events and anybody who performs for crowds!